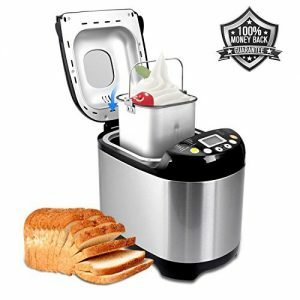 The number 1 release Tobox Bread Maker is automatic and programmable with a variety of user-friendly features and a decent 500-watt power motor (120A, 60Hz). It is rated 5 out of 5 stars with a total of 55 customer reviews and ratings at the time of this product review. The smart digital LCD display panel gives you 19 different options which include basic, quick, sweet, French, whole-wheat, rice bread, gluten free, dessert, mix, dough, knead, cake, jam, yogurt, bake, sticky rice, rice wine, defrost and stir-fry. So you have an idea with the variety of things you can do with this bread maker. Please note that the bake function is for those that like to do the kneading and rising separately. You can set the timer to 15 hours ahead to delay the bread making and prepare it 15 hours in advance. You can choose from three different amounts of 1.1, 1.7 and 2.2 lb. and three crust shades of light, medium and dark depending on how you like your bread. 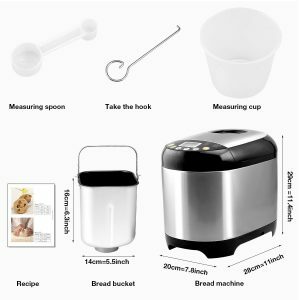 TOBOX Bread Maker is very easy to operate as you just need to put your ingredients into the non-stick pan, shut the lid slowly and plug the cord into an outlet. Then adjust the settings for loaf size, color and whatever you wish to choose out of the many different bread options and press the Start button. The top cover is also made of stainless steel and there is a small glass display window for you to see what’s going on in the bread maker without having to open the lid. If you find the bread being heavier or lighter than you’d like, just adjust the yeast content. It is very easy to clean as it has an aluminum alloy interior and a non-stick pan and all the detachable parts are safe for the dishwasher. And the stainless steel body/exterior can be wiped with a damp cloth. It has the keep warm and memory functions with a ten-minute power interruption recovery so you get good results consistently. It weighs 5.5 pounds (2.5kg) and is fairly large, will take up some space on your counter (box dimensions are 15.2 x 14.6 x 11.6 inches). It works as it should and does the job well and makes the bread making the task easier for you and lets you make a variety of bread, pizza dough, rolls and cakes and even jam and yogurt. It is easy to use and runs fairly quietly when kneading the dough- making less noise than other bread makers. The bread you make will often be better than what you buy at the shops and is easy to get out of the non-stick pan. The price is low considering the build quality and functionality- what you can make with this machine. It is offered with a 30-day hundred percent money back guarantee which means you can return it for a refund if you’re not happy with the bread maker for whatever reason. Customer service team is also quite knowledgeable and helpful. With many certifications from authorities like CE, FDA, CB, ETL, and LFGB, it is food grade, environmentally friendly and perfectly safe to use. In the box, you’ll get the Tobox Bread Maker, a recipe book, a user manual, a measuring cup, a measuring spoon, and a taking hook.